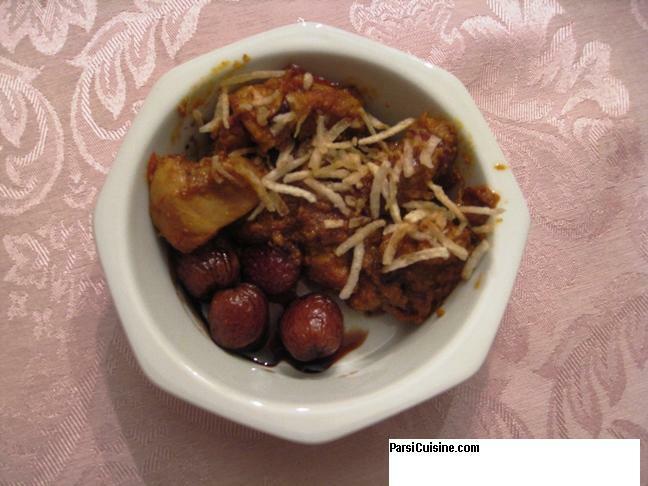 Jardalu ma marghi is one of those fruit-and-meat dishes that reach far back into ancient Parsi culinary history, long before the migration to India. The starring ingredient in this royal dish is a type of apricot that comes to us from central Asia. Its scientific name is the same as for other apricots, Prunus armeniaca, so the only way we can distinguish a jardalu from the rest is to call it a Hunza apricot, as they do in Britain, or a jardalu in Gujarati. The Hindi/Urdu word, zardalu, means yellow plum. Niggling matters of nomenclature aside, this homely, wrinkled little dried fruit is truly regal in its taste. Since it belongs to the category of sweet-kernel apricots, it contains a surprise. Crack the pit and you get a tiny nut thats indescribably delicious, well worth the effort to get at it. Carefully remove the pits from the poached jardalus when they are cool enough to handle. Rinse the jardalus. Combine the sugar with 1 to 1 1/2 cups hot water and stir to dissolve the sugar. Pour this over the jardalus and add enough additional water to come a couple of inches above them. Stir to combine. Let the jardalus soak for a few hours or overnight. Sear the chicken in a heavy skillet over high heat until the thighs are browned and have rendered their excess fat. Coat them with the paste and set aside at least 30 minutes. Heat the oil in the same skillet. Add the chiles, cumin, cinnamon, cloves, and cardamom and sizzle until the aroma rises and the chiles look toasted. Add the onion and cook, stirring occasionally, until it softens. Add the chicken. Combine well with the onion and spices. Add enough water and jardalu poaching liquid to cover. Add salt to taste. Bring to a boil; reduce the heat, cover, and simmer until the chicken is tender, about 30 minutes. Check for salt and sugar. Finish with the Madeira. Add the jardalus only when you are ready to serve so they dont break up before you present the dish. Cookbook: Parsi Cuisine Manna of the 21st Century. Cookbook: Parsi Cuisine Series, Meats. Summer is here and fruits like Apricots, Peaches, Apples are growing fresh in garden plots. This meat gravy goes well with fresh fruit, sauted and soaked in a brown sugar syrup on the side.